Just ME: Mama Elephant May Stampede! So cute, Elena! Love how you did the sentiment! Super cute. Love the bridge! Cute card! The splatter was such a great way to make some rain! Just a beautiful card... love all the elements you used from the new stamp set. Must try the double stamping of the sentiment, wondered how you did that! I love this scene and the sentiment. What a great stamp set. How pretty! :) Love it! Fun card...I love the whimsy! What a great card I imagine giving to a good friend. Thank you so much for a chance to win! Very nice scene you made! AWWWHHH What a CUTE scene! I love the dotted swiss clouds! Your card is so cute. Thanks for sharing. Very pretty. St. Louis just finished a bridge that looks somewhat like the one in the stamp set. I'll have to get this set and use it for my greeting cards to friends Great card. Such a beautiful card! This stamp set is so cute! What a beautiful card. I love the clouds and the colors. Just sweet! I follow Mama Elephant on facebook. I liked and shared. I follow Mama Elephant on Twitter under @TOnlyalady. Lovely card. I love the double stamped greeting. Beautiful card. Love this fun stamp set! Such a nice card. Totally different take on this stamp set. Makes me want to go for a ride in a double decker bus! (something I have never done) Very nice card! Oh, this set is so sweet! I love your card, Elena! Super cute, love the way you added the clouds from the Landscape Trio die set. Thank you for the chance to win! Such a cute card..love the clouds !! Love the soft colours on this card and the fun elements! Thanks for sharing! Love the Card!! Your cards are always GREAT!! Great scene I love your work! These sets are so great. I love your card. Oh what a fun stamp set and I adore your card! What a lovely card--I love these new sets from ME! Thanks for sharing! I love the soft look of this card! I think I need to get this set! Fun card! All the cards are great! I love this scene, such pretty card!! Adorable! I love the polka dot clouds! Great card...so much fun! What a great stamp set! Thanks for the chance to win! I like the little flag coming off the back and the way you stamped the sentiment on top. Love the double stamping effect! Awesome release from Mama Elephant! Love that you stamped the sentiment across the bus and added the clouds to the top. Your card is just wonderful! Really like the new release! Very soft and lovely! Great sentiment! Love the patterned clouds, great card! so getting this set so perfect for all those graduations I have to go to soon! Double stamping the sentiment was a BRILLIANT idea. Well done! This double decker bus stamp is so awesome! I love the ideas that we are seeing! The black stitching on the perimeter of your card is a great touch. Such a fabulous card design, love your double stamped sentiment!!!! Oh a very nice card! I love it! I love the way you present everything! Give me a ride! Those clouds are cute!! great release and stamp set!!! wonderful may release. Very cute scene you created--love the cloud border. 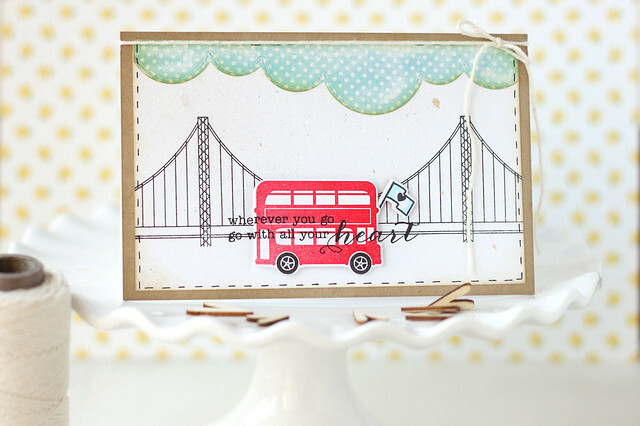 This is an adorable card with the polka dot clouds and the cute double decker bus from the stamp set. What fun! I love what you did with the sentiment and the clouds add just the right pop of color. Very sweet card! Super cute card! All the elements just work perfectly together her...love it! I like ME on FB and posted about the new release! Very cute card! I love that little double decker bus! How cute is this! Great card! Thank you what a great card. Love it! Great card! I love the polka dot clouds!! Super cute card!!! Thank you for give all of us the chance to win!! Good luck to everyone!! Cute card! Perfect for traveling friends! Love this fun creative card! Terrific card, Elena! The double stamped greeting is awesome. Great card! 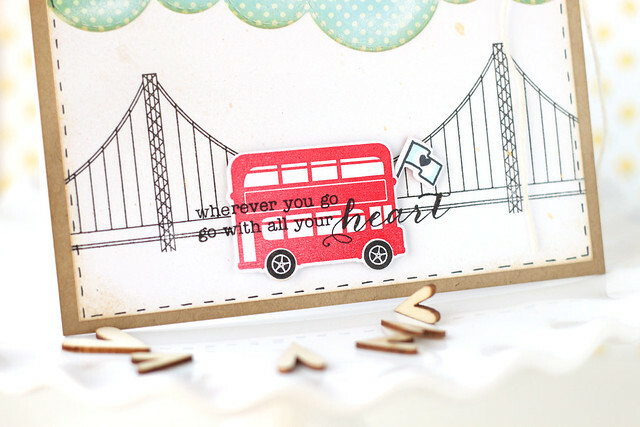 Love the sentiment and that cute double decker bus! Lovely card. Love it's simplicity. I am in love with the bus! I like the way you did the sentiment. I like this card but not too sure about the mildew! LOL Good job, thanks. Fun card with a great sentiment! Love your card it is soooo cute! I love the card...super cute! I "like" ME on FB too! Love the card, and love that sentiment! What a beautiful card I love it as it reminds me of the Macinac Bridge in Michigan been over it many a time you really created a beautiful scene its so serene and definitely tells the story of the sentiment you chose. Great creative job!! So, so pretty. Love the design and the colours you chose. I just love that double decker bus! So cute Elena! Love these images and the scene. Really love the double stamped sentiment. Cute! LOVE your super cute scene and sweet sentiment!!! Fantastic scene. I love the way the sentiment drapes over the popped up bus and your scalloped sky. Keep forgetting to tell you this week that I do "like" you on FB (actually I LOVE Mama Elephant!) and I did share because if Tracy M wouldn't have shared with me about you I still wouldn't know about your amazing designs of stamps you do!!!!! Fun card, Elena. I love how you double stamped the sentiment!! Love the new release!! Cool card. I'll be in London next week. I hope it doesn't rain. Thanks. Super cute card! Love how you double stamped the sentiment! Aw....I love the little heart flag flying on the front of the bus! Adorable! great creation. thanks for sharing. This card is adorable love the polka dot clouds, the little flag at the front of the bus and that you stamped the sentiment right on the bus and what a lovely sentiment it is! I'm so psyched with this stamp set - so cute! I'm also following on Facebook. What fun! I love the double decker bus in this set! Such a cute card, Elena. I love the way you did the sentiment! Beautiful! Love love LOVE your card!! The sentiment and especially the way you added the little flag dimensional on the double decker bus just makes the card POP! I'm a follower/liker of Mama Elephant on Twitter and FB and I just LOVE the new release! I love those clouds and that bus is awesome!! Great card!! love this card - great job! Such a cute card. Thanks for the chance to win. I like the sentiment on top, I should try it more often. Oh, I'll take a trip on that bus! Cute card...thanks for sharing! Love everything about your design! You do awesome work! So sweet! I love the upside down cloud die and I think of JJ too!!! I follow ME on FB and shared about the Stampede there. Love the polka dot clouds! Cute card! I love the scene you created. I love the way you stamped the sentiment. Will totally have to try that sometime. What a great quote, and I love the flag in the front! Great card! LOVE those polka dot clouds. They're the perfect touch for this scene. oh boy. another masterpiece! i LOVE that bright red bus on the bridge! amazing scene! and the sentiment stamped on top!! dude! just love it!! That his it's too cute! Lovely card~ love the placement of the sentiment! Amazing card. Cute polka dot clouds!